When you create a Wild Apricot account, you are provided with a free website address. It is generated automatically based on the organization name you enter when you create your trial account, but you can change it at any time. If you already have your own custom domain address and if you have a billable Wild Apricot account (not a free one), you can use your custom domain name in place of your free Wild Apricot address. Wild Apricot provides free secure access to wildapricot.org domains. 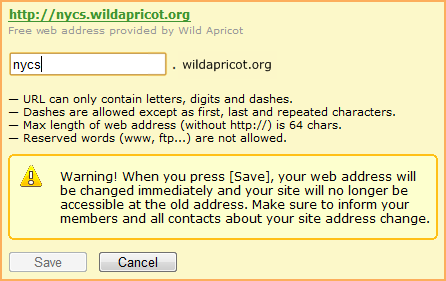 Accounts that use other free domains (such as camp7.org and memberlodge.org) are provided an additional wildapricot.org domain that can be accessed using a secure https URL. You can use the secure wildapricot.org domain in addition to your regular website address, or you can switch your website to the wildapricot.org domain. For custom domains, you can also use the wildapricot.org domain for secure access, or we can install your own custom security certificate on your custom domain for a separate charge. For details and pricing, see Securing custom domains. From the Domain name management screen, you can change your free Wild Apricot domain name, and add or remove custom domain names. To display the Domain name management screen, go to Settings then click Domain name under Site settings. To change the first part of your free Wild Apricot domain name (the part in front of wildapricot.org), click Change. Enter the new domain name prefix (following the on-screen instructions regarding restrictions) then click Save. The change will take affect immediately, and your site will no longer be accessible at the previous address. If you already own a custom domain name, you can use it in place of the free address provided by Wild Apricot. The custom domain must be properly set up according to these instructions. You cannot use a custom domain name with a free Wild Apricot account. To add a custom domain name, click Add custom domain name then enter your domain name. If you add a custom domain name without the www prefix, we will automatically add domains both with and without the www prefix. One domain has to be designated as the primary one – by clicking Set as primary beside the domain name. After setting a custom domain as your primary domain, you should review your traffic encryption settings. If you set traffic encryption to Always, and do not have a security certificate installed, visitors to your site may encounter security warnings. If you add a custom domain name like nycs.org, we will automatically add both www.nycs.org and nycs.org. If you do not want both, you can delete one by clicking Remove. If any of your custom domain names is marked as Invalid, it means that our system has detected incorrect DNS records for your custom domain. You can click the Check button for more information. For more information, see Custom domain setup. If the status of your domain name is marked as Incomplete, then your domain's A-record was set up properly, but the SPF TXT record was not. In this case, all emails sent from your account will still use the default Wild Apricot email address based on your free Wild Apricot domain name. Domain names that are marked as Incorrect or Incomplete cannot be set as your primary domain name.